There are few things that have made me feel as out of touch with the world as the sudden obsession with Pokémon Go. If you’re not playing, you may not understand a huge number of conversations happening around you. And while I can’t help you understand the game itself, I can fill you with stories about what it’s doing to our world. Because from the sound of things, this game is simultaneously brightening and destroying it. —First off, here’s a reminder to all of us that feel left out because this just isn’t our thing, that it can not be our thing without crapping all over it. —Between the impetus to spend so much time outside, the social elements, and the just general fun of the game, it’s not surprising that a lot of players are feeling improvements to their mental health. —Plus, it turns out it’s a cool way to meet celebrities. —A lot of people are not throwing away their shot to cash in on their and/or the world’s obsession. 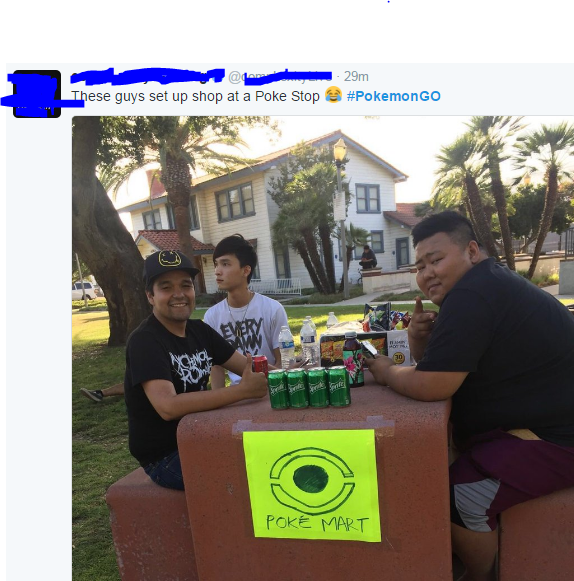 Like this woman who’s charging $20 an hour as a Pokémon Go trainer, these guys who know it’s all about location, or, my favorite, this kid who wants to keep other players safe, and— no shame!— make some money at the same time. —It’s also raising money for charities. —People have been embarrassing themselves all over the place this week, from falling into things, to walking through TV weather reports. —Beyond embarrassment, though, things can get really dangerous for all of these people who keep forgetting to look at their surroundings. Like these guys who fell off a cliff while looking for Pokemon (and survived), or this man who totaled his car. —And then there are the muggings. —And all the dead bodies people keep finding. —Plus, all those social interactions are great… until they’re not. —Who decides where Poke Stops are? Because they’re not doing a super great job.